I see to have a sall proble. Blogging is y ain sorce of incoe right now, and y oldest daghter spilled soda pop on y keyboard. I rinsed it ot, and now it’s drying. I got ot y older keyboard, which is apparently issing a few letters. For iportat proects, I can ct and paste the issing letters, bt that is really slowing e down. Does anyone have tips on how to dry ot a keyboard in a hrry? Or is there soething I can do to goose this old one into perforing better? Please excse typos. Thanks. Try turning the keyboard upside down, too...that will help drain it. said actor212 on April 23, 2007 9:53 AM. I got ost of it to drain by trning it pside down and holding the control key. There are still a cople of drops visible throgh the botto, bt it will not yet work at all. said Miss Cellania on April 23, 2007 10:05 AM. said MrDave on April 23, 2007 10:07 AM. you can also pop off all the keys, pop 'em in the dishwasher, wipe down the board and put it back together. said BP on April 23, 2007 11:06 AM. If blogging is your sole source of income, you might consider purchasing some "extra" hardware. Switch keyboard, let the coked keyboard dry out, switch back at your leisure. said Jason on April 23, 2007 2:39 PM. I have two keyboards... the wet one won't type at all, and this backp is issing a few letters. I ay have to get a third one! said Miss Cellania on April 23, 2007 2:50 PM. Unfortunately, her share of the revenue from THIS blog probably doesn't cover the cost of a keyboard. said Scaramouch on April 23, 2007 2:53 PM. Even so, there is no reglar ac store here. I'd have to order one, which wold take days. said Miss Cellania on April 23, 2007 3:03 PM. I used to fix laptops etc, and unfortunately there is no good way to dry it once the liquid gets between the layers (assuming cheap membrane-type switches versus *CLICK* mechanical ones) - they can stay damp enough to malfunction for weeks, even months, and by the time they dry the contacts are corroded. 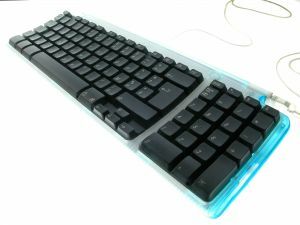 In a shop situation, it involves stripping the keyboard apart and hand-drying each component, but these days many keyboards have the membrane layers glued or heat/sonic welded together. As a last ditch effort, you can preheat your oven to the lowest setting, turn it off, and put the keyboard in on something insulating while it cools (goal is to speed up evaporation without melting anything). said The CyberSlug on April 23, 2007 4:52 PM. said Pondscum on April 24, 2007 1:17 AM. Update: I got a new keyboard! I'm back in business! said Miss Cellania on April 29, 2007 12:44 AM.